Help Rosie film the best Soap Opera ever! Run the sets and make sure all the actors are happy in this fun and exciting Time Management game! Rosie must keep things sailing smoothly in order to film her hit TV show. 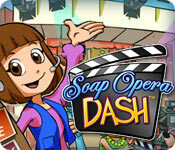 Get help from her friends as you go on a frantic Soap Opera Dash! Show the world how talented Simon is and help him shoot to stardom. Upgrade your props and set locations as you wow the critics! Help Rosie film her Soap Opera! Check out more PlayFirst Games! You have to carry along with Nicole and more new job shop owners, as well as to solve various puzzles and riddles! Help Anny organize a farm and solve the mystery of Mayan's tribe! Hire workers, decorate your farm, and more in Farm Tribe! A super-charged sequel to the hit time management game Turbo Pizza.